Down 2-0 to Northeastern after one, the #8/6 Terriers rallied to tie the score in the third period and then completed the comeback on Jordan Greenway’s power play goal three minutes into overtime for a 3-2 win in game one of the best-of-three quarterfinal series. 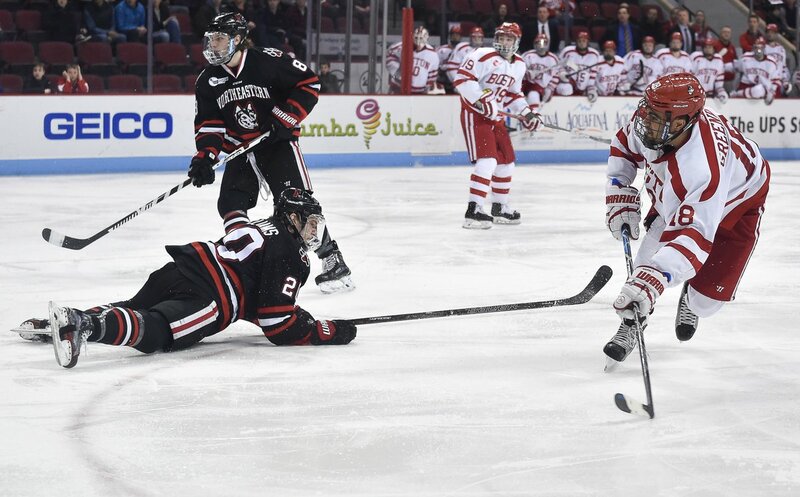 Division 1 scoring leader Zach Aston-Reese gave NU an early lead when he corralled a loose puck behind the goal line, skated behind the net and out in front, beating Jake Oettinger. Two-and-half minutes later, Jeremy Davies completed a backdoor passing play to put the Huskies ahead, 2-0. Oettinger kept the lead right there later in the period when his lunging stick save robbed Davies (video) at the goalmouth on a power play. BU dominated the second period and cut the lead in half on Dante Fabbro’s power play goal at 7:33. Kieffer Bellows sent the draw back to Brandon Hickey, who slid the puck to Fabbro for a 40-foot wrist shot that sailed past Ryan Ruck with Bellow’s providing a screen. 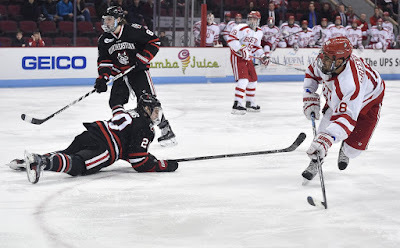 The Terriers scored the equalizer midway through the third when Patrick Curry forced a turnover behind the Huskies’ net and fed Chase Phelps in the slot for a shot that beat Ruck five-hole. BU had to kill a pair of penalties in the final nine minutes of regulation and held Northeastern without a shot on goal. At 1:35 into overtime, Clayton Keller drew a hooking call and BU went on the power play. Chad Krys gloved down a clearing at center ice and sent the puck ahead to Charlie McAvoy who dished to Keller. The freshman center put a cross-ice pass on Greenway’s stick at the left circle and his wrist shot beat Ruck high to the stick side for the game-winner. BU converted 2 of 5 power plays, while holding NU’s second-in-the-nation power play off the board in four attempts and limiting the Huskies to just four shots. Terriers played much of the game shorthanded as both Bobo Carpenter and John MacLeod were injured in the first period and did not return. Coach David Quinn did not offer details. 2017 recruit Hank Crone score his 19th goal and added an assist in Fargo’s 5-1 win against Cedar Rapids. He has 46 points and is two shy of 100 USHL career points. 2017 recruit Brady Tkachuk scored a shorthanded goal in the NTDP U18s’ 4-2 win against Lincoln. He has a 19-21-40 line in 46 games. 2017 recruit Shane Bowers scored his 19th goal and assisted on another in Waterloo’s 5-3 win against Dubuque. The Halifax native has 43 points. 2017 recruit Kasper Kotkansalo assisted on both Sioux Falls goals in a 3-2 shootout loss to Omaha. 2018 recruit Tyler Weiss scored a goal and added an assist in the NTDP U17s’ 6-3 loss to Chicago. Weiss is currently the top scorer on the U17s with 28 points. Evan Rodrigues opened up the scoring in Columbus on Friday night with his third goal of the season, but the Sabres lost to the Blue Jackets, 4-3. Nick Bonino scored his fourth goal of the week—and 13th of the season—in Pittsburgh’s 3-2 shootout win against Edmonton. Sahir Gill scored a goal and an assist and David Warsofsky collected two helpers in Wilkes Barre/Scranton’s 8-1 thumping of Hartford. Ain't no party like an Ahti party!